Spain's Priorato region is producing wines with ambitious price tags on its bottles, so we thought it time to assemble a group of these and see what's happened since our last visit. The region features rather rugged mountain terrain, with many terraced vineyards which produce somewhat small yields. Today there are more than 1300 hectares in the appellation with some 450 growers. There are some 37 wineries there, most bottling their own wine exclusively. Our tasting featured "currently available" wines, so we focused on the highly regarded 2000 vintage, including a couple of older wines simply because that's what's currently in the market here. Priorat, located a few hours drive south of Barcelona, is a rather dry region. The sparse rainfall during the growing season means the vines must really send the roots into the ground in search of sustenance. The crop levels, therefore, tend to be small. A side benefit to the dry climate: no rot to contend with. Cariena (Carignane) and Garnacha (Grenache) are the foundations of Priorat red wines. They also cultivate Garnacha Peluda, Cabernet Sauvignon, Syrah, Merlot and other varieties. The wines are routinely 14% alcohol (I think the legal minimum is 13.75%), so these are not light, fruity, "easy" reds. One wine ran away with the tasting, with one wine well behind the pack. Overall, the quality was quite good. With Gerald Weisl adding his Two-Cents' Worth. 8TH PLACE: ODYSSEUS 2000 PRIORAT "Viedos de Ithaca"
A former regular at the tastings always described the Brettanomyces factor as "smelling of silage." When we opened the discussion a chorus went up exclaiming "silage!" Others added "medicinal," "tar," "bitter tannins," "green," "dirty sweat socks" and "overripe, hot finish." from Brettanomyces and dark fruits. It's an intense wine but you couldn't guess where it came from or what grape varieties might be present. It tastes just like it smells along with some very grippy tannins. The Brettanomyces seriously detracts from some obviously deep fruit." Gerald charitably described this wine as "Rustic...earthy, slightly funk notes along with a big of oxidation. It's way out of balance, being extremely tannic, yet the fruit is already spent and it has no place to go in terms of cellaring." 7TH PLACE: FINCA DOFI 2000 PRIORAT "Alvaro Palacios"
One taster complained that "the wine was fruity but had no back bone, no complexity." Another judged it to have a "big, ripe nose but hot and simple on the palate." Other comments included "cough syrup," "citric," "tannic," "bitter Cabernet" and "weedy." Another found much to like. "This is a soft, rich, round wine with lots of spice and fruit and hints of white pepper." It was Bob's favorite. "Stunning nose expresses varietal components of Carignane and Grenache with perhaps some Cabernet/Merlot in support. There's a stony terroir, a depth of berries and red fruits. Wow! And what a tough, big mouthful showing great depth of fruit. Classic Priorat, great wine! Gerald also liked this wine, ranking it third. "Ripe, deep berry notes to this big, warm red...nice balance of oak on the nose...fairly full-bodied and rich. Lots of fruit on the palate...the texture of this is excellent, being rather plush and silky. One-and-a-half stars on Gerald's three star scale, no stars being a standard or ordinary wine." 6TH PLACE: CIMS DE PORRERA 2000 PRIORAT "Classic"
One taster had a very positive take on this wine: "Good herbaceous fruit, intense, structured with a long finish. To its credit, it doesn't rely all that much on oak." Another taster remarked that "it developed beautifully for me as I tasted it." But another had just the opposite take: "It declined progressively in the glass." Another found it "over-ripe" and two tasters found, by turns, a "funky nose" and a "queer nose." Bob found it a bit "shrill at first with notes of strawberry contributed by Grenache. It has loads of Cassis, pepper and (unmistakably to me) pepperoni." (The queer note?) "What a stunning mouthful! Tasting to me predominantly of Grenache, there's full throttle fruit, length and a great chew! Gerald was less thrilled with this wine, describing it as "A bit earthy and showing dehydrated fruit notes with its raisiny fragrances...stewed fruit...it's big on the palate, but abrasively chalky in texture. You'd need some fatty red meat to tame this or duck with prunes. Perhaps worthy of a one star rating." 5TH PLACE: CLOS MONLLEO 1999 PRIORAT "Sangenis I Vaque"
Comments were all over the map. "Very beefy/peppery," "Shellac on the nose," "Sweet cream," "Vegetal, sour fruit," and "Bell pepper and spice." Someone added "a great, seductive nose but not much happening on the palate." Bob thought "this was the wine of the set that showed the most influence of Cabernet and Merlot but what Cabernet and Merlot! There were sweet herbs, spice and smoke. Plums and a hint of bell pepper were evident on the palate along with flavors of Carignane and Syrah. The wine is long and nicely mouth-filling." Gerald found this wine to be excellent and complex. "Sweet and ripe, red fruit aromas of cherry and berry are followed by a bit of coffee, vanilla and then, some violets and even a touch of pepper! The wine displays a lovely plummy fruit character on the palate, along with the vanilla and coffeeish character. Two stars+." 4TH PLACE: CLOS FIGUERES 2000 PRIORAT "C & C Cannan, Proprietors"
One taster was struck with the "wild aromas that kept changing. First there was 'wet wash cloth', then it showed a lot of oak and then lots of Bing cherry" Another found "minerals, wet stones, cranberry and a nice focus in the mouth." Another liked its "sweet berries and tobacco, a well balanced wine." Others added "showy wine" "anise in the nose" and "young and bright." Bob much liked the wine too. "There's sweet spice, plums and fruit skins; Carignane and Syrah seem to dominate, the Syrah contributing some 'meaty' notes. There is excellent fruit in the mouth with notes of Cassis and spice, and moderate tannins. Delicious!" 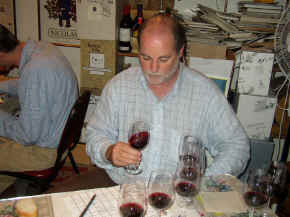 The Clos Figueres showed a smoky character, according to Gerald. "I found some medium intensity berry fruit and a woodsy note. The smoky character is intense on the palate, with charred wood notes. A bit warm. Good wine, though. One star." 3RD PLACE: CLOS MOGADOR 2000 PRIORAT "Isabelle I Rene Barbier, Proprietors"
"A spicy wine with lots of back bone," exclaimed one taster. Another judged it "your average, straight-ahead deep wine with nice fruit and good wood." 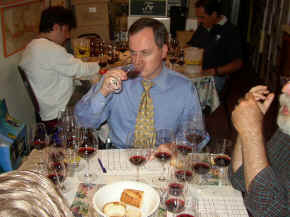 But tasters were divided on the issue of tannin. On the one hand one taster found "a round, full bodied wine with very little tannin - the closest of the set to being ready." On the other hand, a taster found it "absolutely stiff with tannin" and another thought it "grossly over-extracted." Bob found "sweet oak and a powerhouse of ripe fruit; dust, smoke and spice. Old Vine Grenache seems to be dominant but there's a lot more going on. Oak sweetens all that deep fruit. Tannins are admittedly tough with a slight bitter edge but the wine is long and delicious!" Gerald felt this wine had more emphasis on fruit rather than oak. "Very nice berry aromas and much less woodsy or woody than most of the rest. The berry fruit carries through on the palate with a hint of a stony note, as well. One-and-a-half stars." 2ND PLACE: GRAN CLOS 2000 PRIORAT "J.M. Fuentes"
"This wine has Caymus oak. We're talking furniture oak!" Another taster found a juxtaposition of "sweet and sour, reminding me of sweet tarts." Another thought the wine had "full fruit, oak with hints of cherry and leather and a long finish." Bob much liked the wine in spite of his 7th place vote. He found it "nicely ripe with a trace cardboard; sweet herbs indicate a Cabernet/Merlot component. American oak gives the wine a sharp, V.A.-like impression. There are some tough tannins but fruit does nicely with excellent concentration. But the wine finishes flat. Gerald was enchanted by the nose, describing this as "Deep, powerful and showing ripe, intense fruit. The alcohol shows itself, too, though, but still, this is very nice. The wine is tannic, big and powerful on the palate. It's got some mouth-drying tannins but is not bitter or coarse. One-and-a-half stars." 1ST PLACE: CLOS FONTA 1998 PRIORAT "Mas d'En Gil"
Bob found "sweet oak and ripe fruit (it reminds me of old style Napa wine) with smoke, fruit skins and considerable depth. Hints of cherries come up in the glass (from Merlot?). The wine has a full, sweet/bitter core with fair depth to the fruit but it finishes hot." 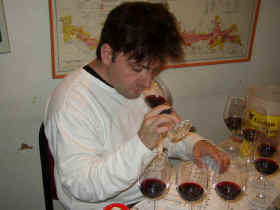 Gerald detected lots of "vanillin fragrances to this sweetly-oaked red wine. There's also enough fruit to keep it from merely being woody. The same elements shine on the palate, with sweet berry flavors and a hint of a floral note. Good oak, lots of plummy fruit and balanced, soft tannins. This is delicious! Two-and-a-half stars."